My Logitech m570 Wireless trackball Mouse Review : Is it Best for gaming? Do you often feel numbness and tingling in the hands after the long hours of gaming? 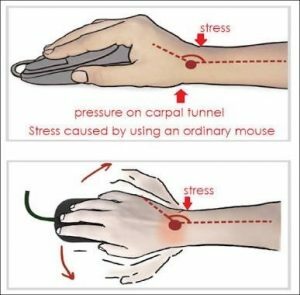 If yes, then there are good chances of you suffering from carpal tunnel. Don’t worry! I’ve also had this problem until I found the real solution in the form of Logitech m570 Wireless Trackball Mouse. Hi there! I am Phillip Lyons, a professional video gamer. Today I am giving my personal review of Logitech m570 trackball Mouse, one of the gaming peripherals that I have recently bought a month ago. 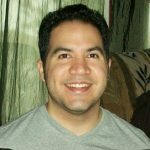 Before we begin, I want to clear to all the readers that whatever I am writing here are my personal opinions that I found after using this product for one month on a regular basis. As a full-time game developer at an office and a crazy gamer at home, most of the time I spend sitting in front of my pc playing games or either designing graphics on a complicated software. All of you are aware of the fact that designing on a software requires a lot of dragging and dropping, pixel correction, more frequent switching from multiple tabs and on top of that, a lot of scrolling. Going through all these I was facing many issues with my hands. In fact, I was quite shocked when I saw my hand literally shivering at one time while I was playing games on my gaming pc, no that was not from cold, but it was something else which I was not aware of at that time. I didn’t take any of this seriously until one day I met my old friend, Jacob, who is also a professional gamer. He told me everything about his part of the story, how he felt exactly the same while he was gaming and also suggested me to use trackball Mouse as a permanent solution. Only after that, I didn’t waste a single second and ordered Logitech m570 Wireless Trackball Mouse from Amazon. After my friend asked me to give a try to this trackball mouse once, I thought why not? And after a month of usage, I came up with the few important observations. You will not get easily familiar with this mouse, it took me a week to be in the flow, and after that, all the memory muscles of my hand just went straight ahead and acted like I was playing with a normal gaming mouse. Initially, I was in doubt that if I get the good performance while playing games with this trackball mouse or not but I was blown up by the speed, precision and comfort level this mouse has offered. Honestly, I was impressed to the level that I almost felt like giving up on my normal gaming mouse. I was addicted to Logitech m570 mouse to the level that I was not able to work without this, and that is when I decided to use it more often during my long hours of gaming. This mouse didn’t just help me out in my gaming sessions but I was also getting too much help in my designing work. To all the designers out there, I ask all of you to give a try to this trackball mouse at once, I am sure you will definitely thank me later for this advice. 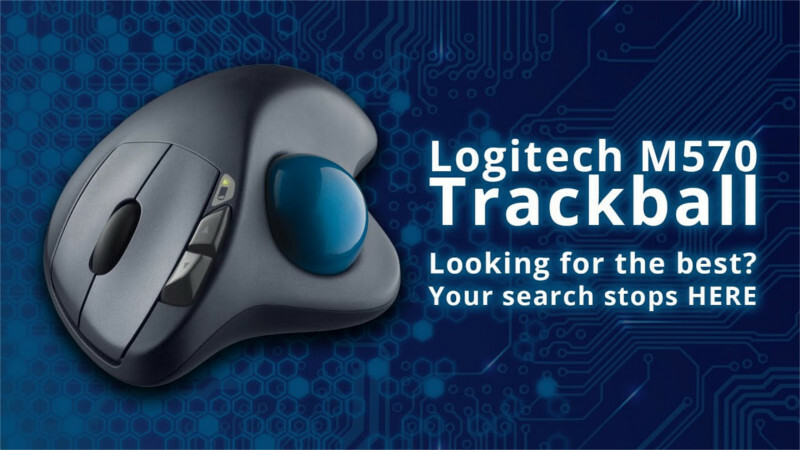 It comes with the Customised buttons that you can programme through Logitech software easily. All in all, my prime focus to shift on this mouse was to reduce the amount of hand/wrist stress and it did convince me well as the feeling of numbness and tingling of my hands almost cuts to half of my previous stage. When I first opened up the box, there was nothing too fancy about the packaging. Logitech m570 came with Duracell AAA battery, unified receiver and the trackball mouse itself. Trackball comfort: You don’t have to move your hands anymore to move the mouse, all will be handled through trackball now giving you more comfort on your wrist. Compact footprint: Not having enough space to move your mouse around, don’t worry! trackball mouse doesn’t move. So you require less space now. Time-tested shape: Well designed trackball shape to provide a high level of comfort. Advanced 2.4 GHz wireless: Enjoy the fast rate of data transmission with no delays, just like a wired mouse. Logitech Unifying technology: It comes with a wide range of compatibility with keyboards, number pads or mice without much hassle. Adjustable speed: The Logitech m750 comes with the adjustable laser sensitivity. Programmable buttons: You can customize the buttons through Logitech software according to your needs in the game. Easy to clean: The trackball is easily removable whenever you need to clean the mouse. As I have already accepted, I was so much in love with Logitech m750 that I wouldn’t trade it, or ready to replace it with any other trackball mouse out there on the market. 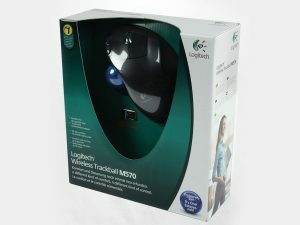 But I gone one step further and eventually got to know about the upgraded version of the m750, which was Logitech MX Ergo. So let see what I found in the new model. First and foremost is the ability of the mouse to tilt by 20 degrees if you find that position more relaxed. At the bottom of Logitech MX Ergo, there is a metal plate which is held to the mouse by magnets. 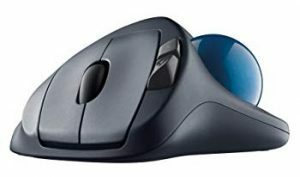 In terms of size, MX Ergo is similarly wide and long as the old Logitech m750. 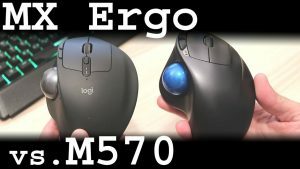 The new MX Ergo is having a look of premium velvet while the Logitech m750 has the plastic body look. And also I found the more number of controls in MX Ergo as compared to the m750. Frankly speaking, it is more of a topic to debate that which trackball mouse is good for buying. But one thing that I really look forward to while purchasing my gaming peripherals is the price of that accessory. 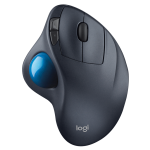 Logitech m750 is a cheap trackball mouse with a lot to offer in terms of features. So I give my vote to m750 when we talk about both the model simultaneously. During my entire testing, I didn’t find any drawbacks in Logitech m570 trackball mouse but here are a couple of things if included would definitely be the cherry on the top. I would definitely appreciate If it had a better angle out-of-the-box. To make it more ergonomic, there has to be a wedge with a 30-degree incline under the mouse to make it more comfortable on the wrist. If there could be anything that stops dirt from entering the sides of mouse trackball. You need to clean it once a week to keep the mouse trackball clean and responsive. Overall, I’m really impressed with Logitech m570. It helped me to enjoy long hours of gaming and at the same time, I can now easily use my designing software smoothly without hurting my hands, mainly wrist position. I highly recommend this Trackball mouse especially if you also feel a little numbness and tingling in your hands. Steam Controller Review: Worth it or Not?